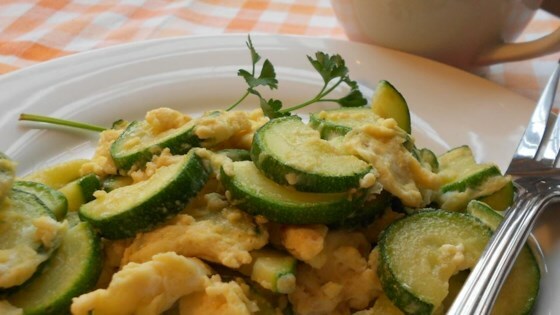 "A match made in heaven: scrambled eggs and zucchini. Note: this recipe is easily doubled, tripled, etc. Ratio of 1 to 2 zucchini per egg. Great served over rice. Variations: add one clove diced garlic to oil before adding zucchini. Or, add any of your favorite fresh herbs; they combine well with the eggs and zucchini. My favorite additions are oregano or rosemary. You could also add two teaspoons soy sauce to beaten eggs, or sprinkle over egg and zucchini when cooked." Heat a small skillet over medium heat. Pour in oil and saute zucchini until tender. Spread out zucchini in an even layer, and pour beaten egg evenly over top. Cook until egg is firm. Season with salt and pepper to taste. Zucchini and eggs! A family favourite. I used cooking spray instead of oil and added garlic and italian herbs. Delicious!!! I added sweet Vidalia onion slices to the zucchini saute and seasoned with oregano. Delicious! The ratio I used was one medium zucchini, 1/2 medium onion, and 2 eggs. I love garlic so I added garlic powder and minced garlic with a little chopped onions and it turned out yummy. Great with buttered toast.